I’ve been enjoying copying the work of other artists, and so I decided to try this sketch from the great Leonardo da Vinci. 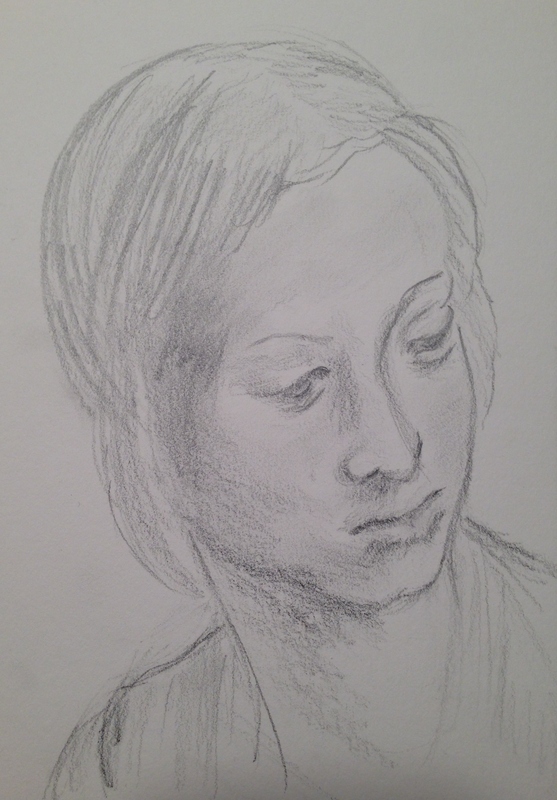 I tried a quick preliminary sketch first, with a Caran d’Ache Technalo watersoluble graphite pencil. I wanted to see the lines, so I didn’t hit it with the water at all. I’m finding I really like the look of a sketch done with water-soluble graphite. It gives an interesting depth, and almost gives the feeling of charcoal on my mixed media paper, without so much smudging. The original work was so beautiful that I had to try again, this time with just a B graphite pencil on the same mixed media paper (just different lighting). I was much happier with this effort. I look forward to revisiting this one again when I can take more time with it. Such lovely lines in the original! I’m learning so much right now from the work of others. What a joy to try and recreate! I’m enjoying this face challenge so much! Enjoy your weekend and I hope you dance! Oh Laura. You are seriously knocking my socks off! This stuff belongs in galleries girlfriend. Wowza! Your artistic growth is amazing!!! Thank you Jodi! I have so much to learn and lots of practice ahead, but I’m making the journey. Aren’t we all? I so appreciate your vote of confidence, my friend! I feel like a million bucks every time I read a Jodi comment! 💛 This is one I could try over and over, because I know that every single time, I’ll pick up something I didn’t before, and just the thrill of seeing his lines is enough to pull me right back to this image. I just want to sink into it. What an inspiration! I can’t completely fathom that he made something over 500 years ago and it survives. It’s mind-blowing when you think about it. Awe-inspiring. I’m blathering! Hehe. Happy Saturday! I’m sure it is a lifelong journey – but I cannot believe the growth you’ve made already in a year – you have truly become a GREAT artist! Blather on Artista! Beautiful. Looking at great work is definitely a good way to learn. Yes! Your post is what got me started! I need to see if I can go back and find it; it inspired me so much. Is that where this resides, Kerfe? At the Met? There’s something about his work……I really need to find a good biography about him. Have you read anything you really enjoyed? I haven’t read any biographies about da Vinci either, but I’m sure there are some good ones. Probably long! What a life. We could all learn from it, I’m sure. No doubt. He was so multi-faceted! Wow, I love your goal to sketch them all! How many have you done? PS If I find a good bio, I’ll let you know. Yes, let me know. I found a Van Gogh bio at a book sale, but I haven’t started it yet (it’s big). All of your recreations to date are lovely, Laura, such talent! It is evident with your posts that you are definitely enjoying your face challenge. 🙂 And so are we! Thank you, Donna! It feels good to feel like I’ve found an area I can really sink into in focus. Any face feels like home to me, and moreso as I get more practice. There is something about his work in particular that just draws me and I know almost nothing about him. I really need to learn more. His stuff is so incredible. I feel honored to even attempt to copy it! I’m really glad you’re enjoying my faces. I’m just loving this project so far. Your work inspires me time after time, so I’m glad I can do something for you in exchange. Have a terrific weekend! Really nice! Faces seem the ultimate challenge to me. I’m impressed with your focus. Thanks, Beverly! I think I really needed the focus. I love faces of any kind and I thought I might lose my enthusiasm, but it just keeps building. I’m taking that as a good sign at this point! Hi Laura, I think Leonardo would approve. I can tell these drawings brought you great joy. Your 100 is proving to be the right journey for now. Thank you for sharing! Thank you, Sharon! I will keep on, it is so joyful! I’m glad you’re on this journey with me! Both are very good. Another artist to study is John Singer Sargent. He has some wonderful pencil portraits. Thank you, Carmel! I will look him up. I’m glad you like these. I definitely felt the second was closer, but I could draw this forever! Looking up JSS now….. This is really good! Adding watercolor to water soluble graphite also produces some interesting results. ooh, that’s an idea, Teri! I’ll have to try that, thanks. Glad you enjoyed this sketch! Have you tried Graphitint pencils by Derwent? They were on my Christmas list but I’ve not had much time to experiment with them. I saw a video on the Mind of Watercolor where he did a portrait using only them and it impressed me so much, I wanted to have the set! The colors are all muted. Great for outdoor scenes. Thanks for your encouragement! I think that’s what I used Someone told me about using them with WC. Laura–this is wonderful. I may get some charcoal when I go to Blick today. I am a sucker for these softly telling lines. Oy! And it’s very inexpensive, Kirk, so bonus! I’m so glad you like this! I became totally enraptured in the experience of this second one. Got some charcoal today. Thanks for the tip. Way to go, Kirk! You’re so lucky to have a Blick close by! Thanks so much, Charlie! Hard, but an amazing learning experience, too! I’m look forward to copying more of his and also John Singer Sargent, as Carmel suggested. I was able to find some beautiful JSS portraits very quickly on G Images, and they are clearer than the da Vinci’s I’m finding. Although all practice is good practice! I’m so glad you recognized her and that you liked it! I was dying to see what you thought! I am so loving this face challenge. I hope I can keep being enthusiastic about faces, because I’m learning so much! Thanks, Lance! I felt a quiet calmness as I drew them. Weirdly. :)) I’ll take it! Very nice, Laura! I’m glad you included the link to the original. How fascinating to see artist’s sketches including the lighter attempts at the edges of the bigger sketch. happy Saturday! Thanks Rachel! Happy weekend to you!! Glad you enjoyed it! Thanks, Eileen! Glad you enjoyed! Thanks Arvind! Glad you enjoyed it. I’m so hooked on faces! Brilliant idea and lovely execution. I used to copy drawings from art books, but haven’t done it for ages. It is such a great way to learn to draw and also to really look at beautiful drawings. It really is, Zoya, because how much do we really see until we decide to draw it. It’s just amazing. I’m so glad you enjoyed this! I really appreciate your comment. I love how you chose to work from and be inspired by the great master! I’m going to say that I enjoy YOUR version more….why? I like your face better, honestly. And the simple fact that you allowed bits of you to show through in the drawing is what I love about Creating art. Well Done! Great study love this sketch! Well done! Thank you so much! I’ve been missing human faces, gotta include those too. So glad you liked this! Yes I did! Hope to see more! You have done a lovely job! I adore water soluble graphite as well. Love the values you can get. Thanks, Alisa! Oh, and it’s so buttery soft. I just love it. So glad you liked this, and I appreciate you stopping by! This came out lovely, what a great idea. Leonardo’s lines are always so elegant, you captured this beautifully. Thank you so much! His lines are incredible, so true. I am learning more from copying other artists than I probably ever will from simply choosing a subject and trying it on my own. I’m really glad you stopped by and commented! There is nothing like encouragement to fuel the flame.